… and to complete the 8,000 kick challenge at the Kick for Life Charity Event. The keen Footbikers included Tammy, Keiran, Tony, Jo, as well as Martin and Monika of Kick Scooter Sydney. 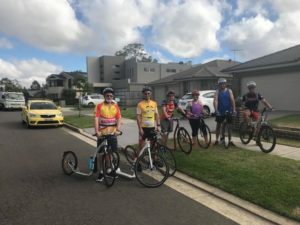 They welcomed a newcomer to the group on the day, John (Hi John – from the Aust Footbike Assoc… welcome to an awesome sport!). Tony was supposed to be on a rest day from footbike training but still attended… because one can never keep a serious rider down! Tony took on the role of ‘pace car’ and ‘support vehicle’ on a MTB for the ride. 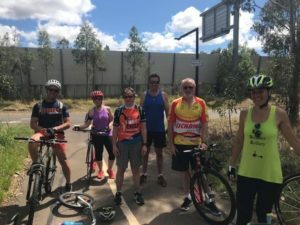 The ride was approximately 25km and started at Kings Langley, followed the M7 out to Rooty Hill and back. It’s a popular route for cyclists, and the Footbikers made a few new friends on-route. The next NSW Recreational Ride will be on the 3rd of December at the Lidcombe Oval Cycling Track. Why not join in.